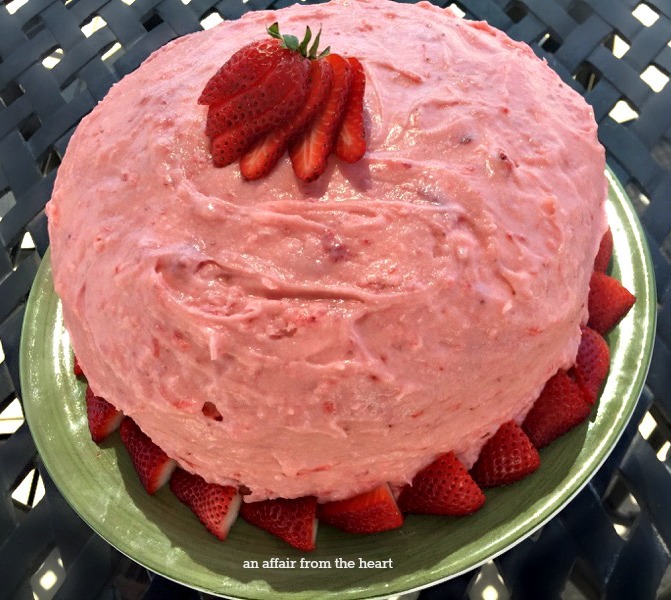 Strawberry Cake - Grandmother's Favorite, with real strawberries inside! 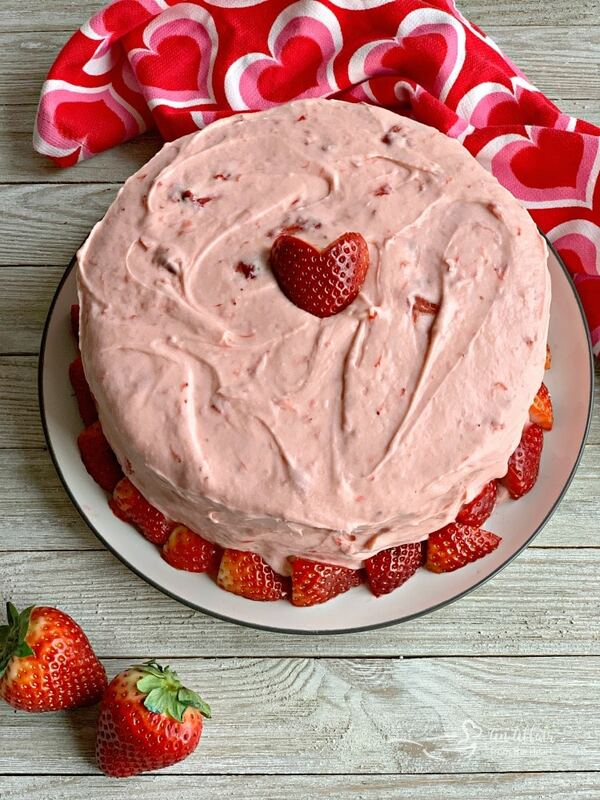 This Strawberry Cake has fresh strawberries in the cake as well as the frosting. It’s Grandmother’s favorite! If you are a fan of strawberries, this is a must try! If you love strawberries, you are going to want to keep reading. This beautiful cake is packed full of them! 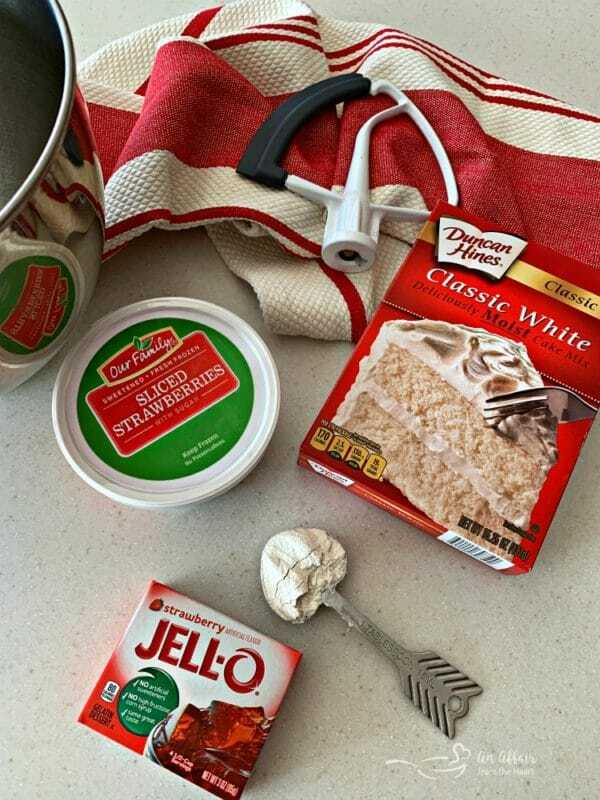 It starts simply with a white cake mix, add in a box of strawberry Jell-O, and frozen real strawberries. The frosting is full of strawberries, too. That beautiful pink frosting comes from the strawberries themselves. I originally blogged this recipe almost 4 years ago. This cake recipe comes from my friend, Candi, who has been one of my closest friends for over 20 years. She also happens to be a fellow food blogger. 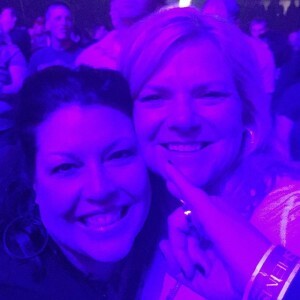 Candi blogs at The Devilish Dish. I have mentioned before, that I haven’t always loved baking. Now, I dream of recipes I can make when I can’t sleep, or even during church (ha ha — really – see: Marshmallow Cheesecake.) Candi, on the other hand, has always had a love of baking, and she is amazing. This is one of the recipes on her blog that I have always planned to make. Lordy! Why did it take me so long?!? 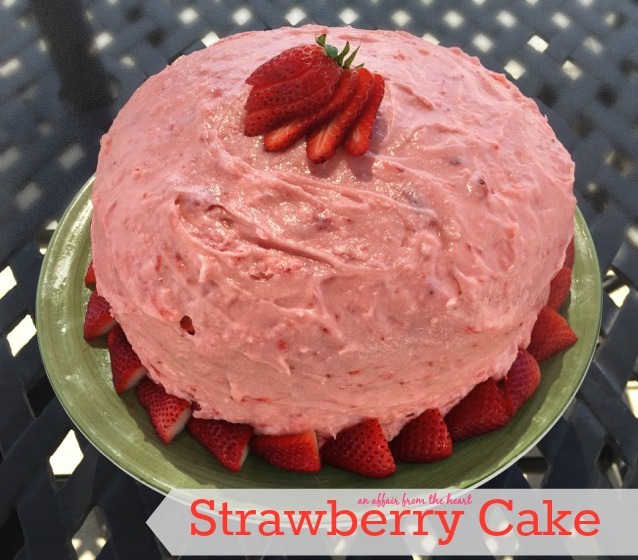 Candi calls this recipe Grandmother Mary’s Strawberry Cake. I encourage you to go read the blog post, because it is one of my favorites she has ever written. Her grandmother made this cake every Sunday, because it was her granddaddy’s favorite cake. That right there is love, people. Back then, I was browsing through recipes trying to come up with a dessert for my Easter dinner, and I happened upon this one. It was that ah-ha moment we all have. My menu was planned. Somethings about my Easter dinner change from year to year, and some things are always present. One thing that typically changes is dessert. You know those people that pass on dessert? The ones that are all “I couldn’t eat another bite.” Even those people asked “can I have just a sliver?” (then came back and asked for a second piece!) Nothing like enjoying a great piece of strawberry cake, on the patio, in the sunshine. But PLEASE don’t wait until Easter to make this fresh strawberry cake! May I suggest Valentine’s Day? It’s perfect for that pink and red holiday I hold so close to my heart! Sometimes when you slice a strawberry it looks like a heart. Look at all of those strawberries in there! This cake is super duper moist. I know there are people out there that frown upon using cake mixes. But I am here to tell you, if you didn’t tell anyone that this strawberry cake recipe wasn’t from scratch they would never know. Well, until they ask you for the recipe, and they will. So be prepared. This cake is fairly simple to make, but know that the frosting isn’t a typical frosting consistency. The first time I made it, it was warm in my kitchen from all of the cooking I was doing, so I kept it in the fridge. Whenever I make this as a layer cake, I find it easier to do a “crumb coat” and place the cake in the fridge for 30 minutes, before adding the rest of the frosting. 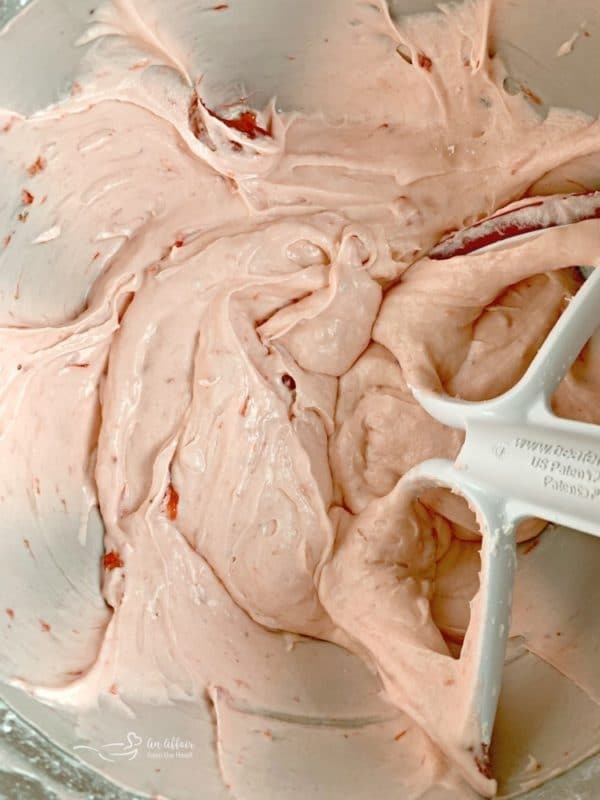 Candi’s original recipe calls for a lot less frosting, but I am here to tell you, you’ll want to eat this strawberry frosting with a spoon. I found that the amount I have in my recipe, is perfect to add plenty in between the layers, and to frost the outside of the cake generously. If you choose to make this cake as a 9×13, you won’t need this much frosting. Cut in half and you will have a good plenty. A crumb coat is a thin layer of frosting that is applied to a cake to seal in stray crumbs before the second layer of frosting is applied. Apply the thin layer of frosting then place your cake in the refrigerator to set up before applying the final coat. After I frosted it, I decided to add some fresh strawberries to the top. Luckily I took the photos right away. I went to take the cake out to serve it, and you know what happens when strawberries meet sugar right? They become syrupy and perfect for shortcake. 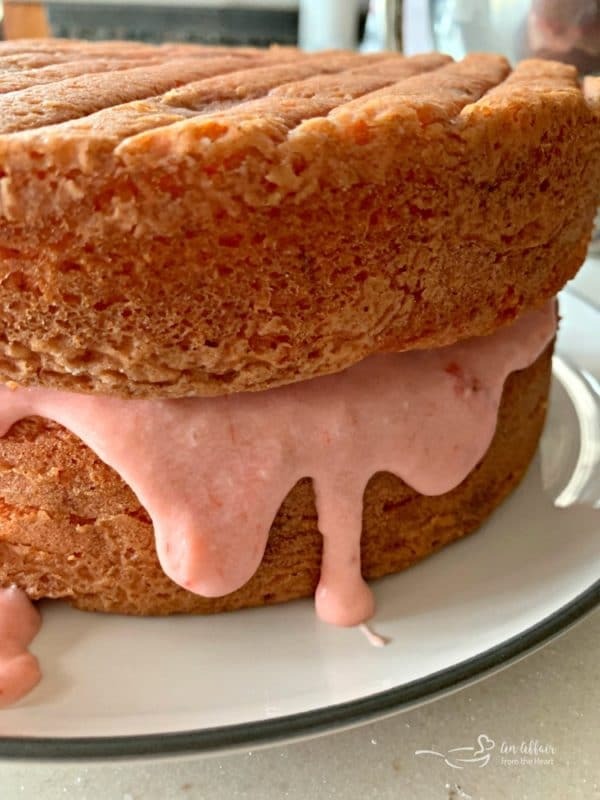 Of course, when they are laying on a cake or arranged around the side touching a sugary frosting, they make little strawberry syrup rivers in your frosting. DOH! So, note to self, if you are placing fresh strawberries on the cake, do it RIGHT before you serve it! Last week, I had a brilliant idea! What if I made this cake, but baked it in my donut pan? Then what if I glazed those donuts with chocolate ganache? Then…. what if I dusted them with cute sprinkles and dressed them up for Valentine’s Day? 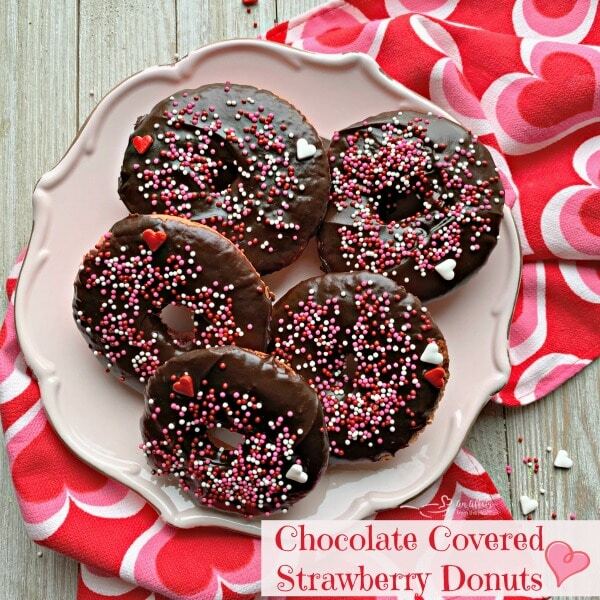 Well, I did all of those things, and named them Chocolate Covered Strawberry Donuts! They are CRAZY GOOD, friends. 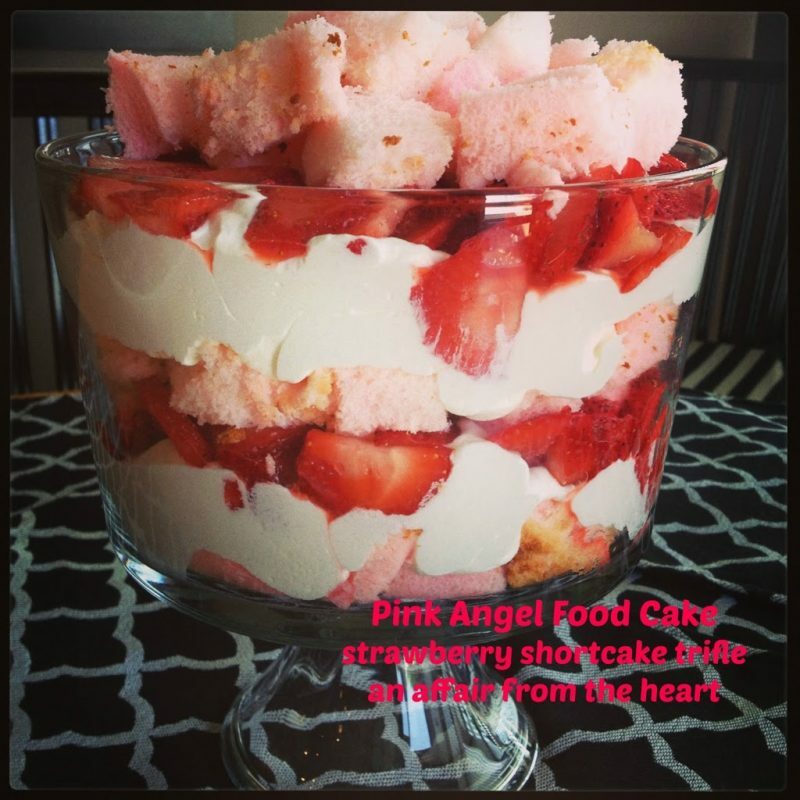 Pink tinted angel food cake, layered with whipped cream and strawberries. So pretty in my pedestal trifle bowl! 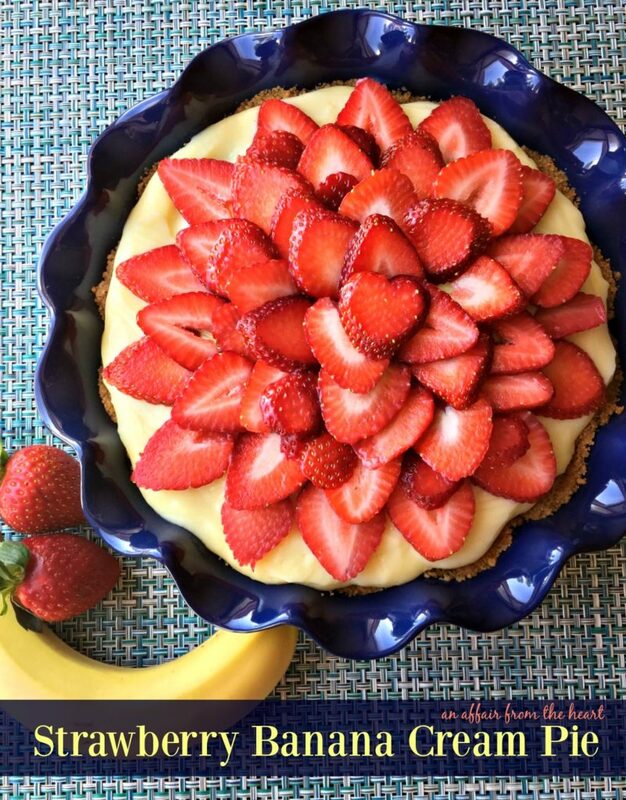 STRAWBERRY BANANA CREAM PIE Graham cracker crust, filled with a vanilla custard and bananas, chilled and topped with fresh strawberries before serving. Beautiful presentation in my scalloped edge pie plate, and so scrumptious! Layers of whipped cream, fresh strawberries and graham crackers will have your taste buds going crazy! This no bake summertime dessert may be old fashioned — but it’s completely fabulous! Out of all of the Strawberry Cake Mix Recipes, this one is hands down my favorite. Who would have ever thought adding frozen strawberries and Strawberry Jell-O to a white cake mix would be this good?! Time to make the BEST strawberry cake EVER! 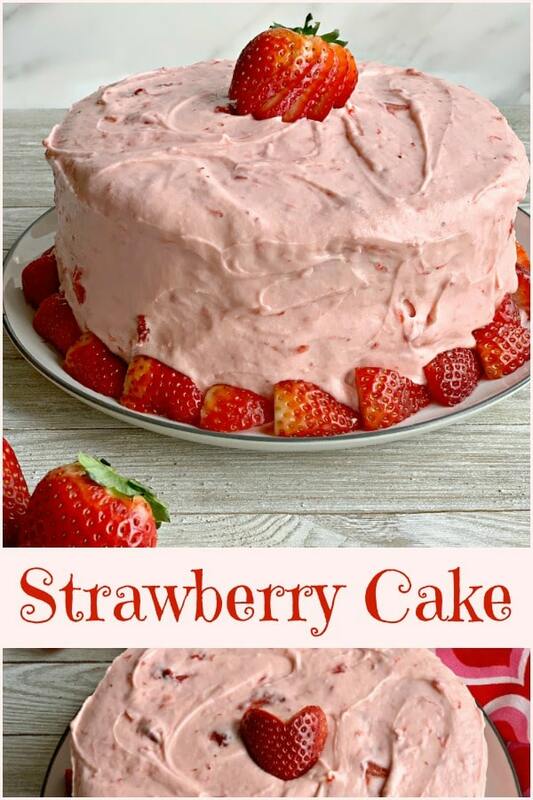 This Strawberry Cake has fresh strawberries in the cake as well as the frosting. If you are a fan of strawberries, this is a must try! Preheat oven to 350 degrees.Grease and flour two 9" round cake pans. Pour into prepared cake pans and bake for approximately 25 minutes. Use the "toothpick test" to make sure cake is done in the middle. Turn out on a cooling rack to cool completely. Pre-Pare the Frosting: Combine frosting ingredients until frosting is desired consistency. Add more sugar to thicken, more strawberries to thin. Frost in between layers, and the outside as you would any cake. Garnish with fresh strawberries if desired. Don't do this step too far in advance, as they will become syrupy. 1/2 cup frozen strawberries is equivalent to one 10 ounce container of frozen strawberries. Reserve the liquid from the strawberries, it's nice to add to the frosting if you feel you need to thin it out as you're making it. Original recipe calls for a lot less frosting. This amount was perfect to add plenty in between the layers, and to frost the outside of the cake generously. I did do a "crumb coat" and placed the cake in the fridge for 30 minutes and then frosted the rest. If you are making this cake as a 9x13, you won't need this much frosting. Cut in half and you will have a good plenty. I love this post. I’m so glad your family enjoyed the cake. It’s a very sentimental and special recipe to me. This is a must try! I love recipes passed down from family and friends! Your omitted the 3/4 c. vegetable oil. Was that an error or your change to the recipe. Oh darn! I made the cake without the oil. I sure hope it taste ok. I didn’t read the comments until after I baked it. Judy, I am SO SORRY!! I fixed it as soon as I saw that comment. When will I ever learn not to type recipes late at night? I hope it was okay? It’s fixed now. I hope this didn’t cause you problems! What is the 1 cake mix. Is this a packet of something?? One box of white cake mix. I made this cake and it was delicious. My granddaughter , who is a teacher and doesn’t get to bake much, said it was the best cake she ever ate. It was moist and not overly sweet. Very good for any occasion. Twice I tried to make this cake. Both times the cake did not rise in the oven. Does the 1/2 cup of frozen strawberries include the juice? All of my family would love this one, but I have no luck with baking. Any suggestions? Thanks. I didn’t drain them. This cake is really wet, and doesn’t rise a whole bunch. My friend, that I got the recipe from, said her grandmother always made 4 layers to make hers taller? Does this recipe work okay using fresh berries? Hi, Dolly! I have only ever made it like it’s written. I would say that if you make it with fresh you should let them sit with a bit of sugar to get that syrupy consistency to them? If you try it, let me know? Is this the strawberry cake you brought to Easter this year? And if I remember right, did you keep it chilled in the fridge? That’s the one! I just made it in a 9×13 instead! This Strawberry Cake, absolutely gorgeous. 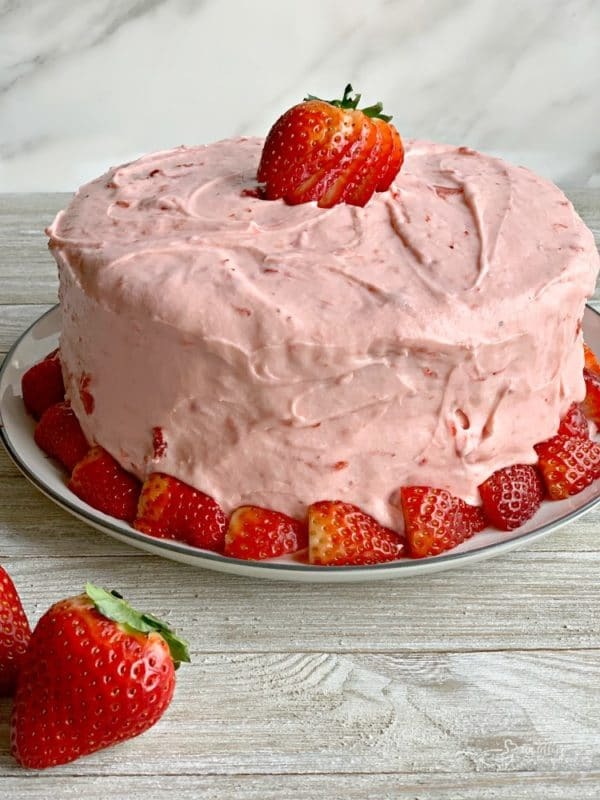 I love strawberry cake and this one looks so fantastic! I will be attempting it soon, thank you for your clear instructions. This is such a pretty cake! I love strawberries and so does my hubby. I’ll keep this in mind for Valentine’s sounds like a winner! Yum! I’m such a fan of strawberry cakes but haven’t made one in ages. Will have to try your recipe! Strawberry cake is my favorite!! Love the frosting too! This looks so yummy! 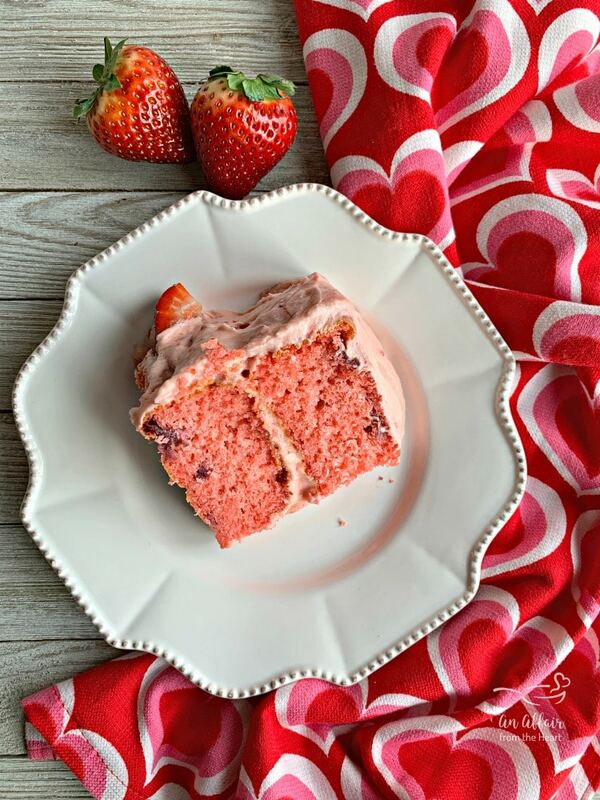 This strawberry cake recipe is sure one that I need to try! 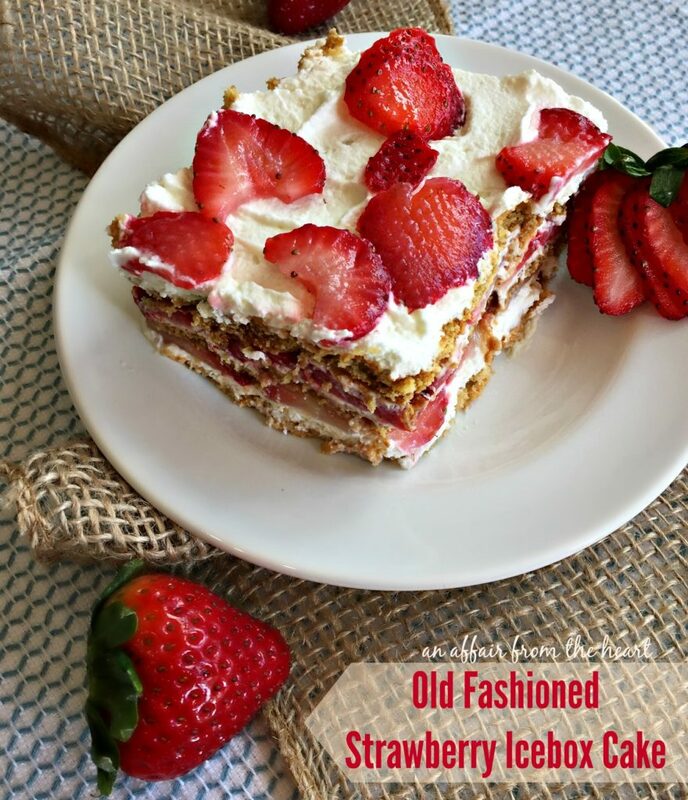 Perfect for any time of the year and love the addition of fresh strawberries! So tasty! I love strawberries, and that frosting has me drooling! I would love this cake! 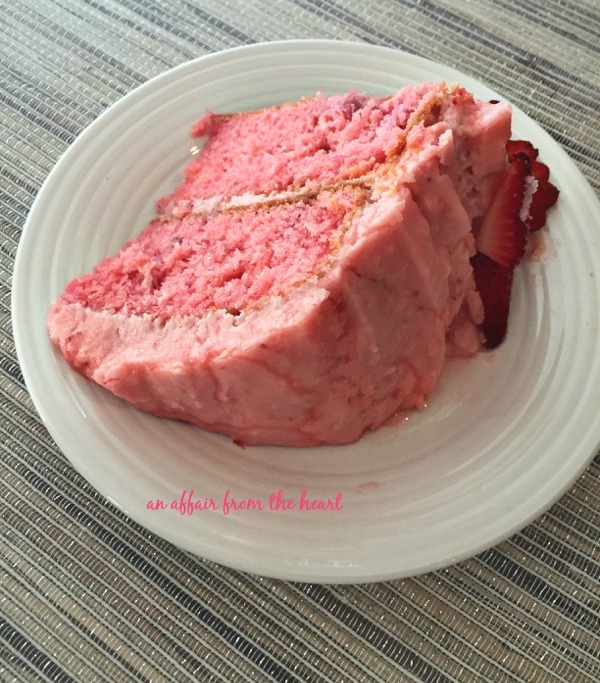 The color of this strawberry cake is so rich and inviting. I can’t wait to dig in. Yum! What a beautiful cake! I am all for cake mixes and boxes of Jello. If it tastes great, then who cares where it came from? Such lovely colors! This would be perfect for Valentine’s day. What a beautiful cake! It is perfect for Valentines but I’ll be making it for my Mother on Mother’s Day! It looks so pretty too. My Grandma used to make cakes with jello all the time… this takes me back to such a happy time! Going to be sure and make this for my brother and sister and revisit some great memories while we eat it!! Strawberry cake is one of my favorite cakes! I need to make this soon! This cake looks fresh and delicious & that color is so pretty! This will be perfect for Valentine’s day! My favorite cake in the entire world!!!!! This cake is so pretty! I love those chunks of strawberries through out the cake. Perfect for Valentine’s Day! I’m in love with this cake! Using a mix as a shortcut is brilliant and this cake looks AMAZING!!! This is such a pretty cake and even though I am making it for Valentine’s Day I already made it for Brooks’ birthday so I hope he likes it twice! On the flour… Do you use all purpose or self rising flour? Hello I’m making this for Easter this year. I noticed the photo of the ingredients shows sliced strawberries with syrup. The recipe states frozen strawberries. I sliced up the frozen strawberries no syrup and thawed reserving the juice from the berries. With this effect the flavor of the cake and frosting? Carolyn – I am sorry I am just seeing this. The strawberries are frozen with syrup. They come in a bowl with a lid.